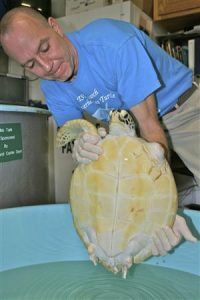 Allison, a green sea turtle, lost three of her flippers in a shark attack. To prevent her swimming in a permanent spiral, researchers plan on fitting a prosthetic flipper attached via a dental implant. The other option would be an external strap-on device. She was rescued in 2005 on the sub-tropical shores of South Padre Island on the Texas Gulf coast and now resides in a small tank at Sea Turtle, Inc, a research and conservation center which among other things rehabilitates injured sea turtles. The implant will go where her lower left flipper once was and even if it is successful she will still not be released back into the wild as the flipper will have to be replaced periodically and enlarged as she grows. The dental implant will be the work of Dr. Sudarat Kiat-Amnuay, an assistant professor at The University of Texas Dental Branch at Houston. It might work on Allison because the size of the dental implant ranges from 2 mm to 6 mm and the diameter of her bone is about 10 mm. “We are going to drill into the bone and then place the implant and let it integrate for a few months and if it integrates then we can add the flipper,” she said. The prosthetic appendage would be made from an imprint of a flipper of a dead turtle of a similar size. Cannabis Smoking may be a Risk factor for Periodontal Disease – Peri-Implantitis?